When a service member is recuperating from combat injuries and/or psychological traumas, achieving regular breaks from hospital care and therapy is almost as important as the medical treatment itself. In order to deal with an injury or handicap, the patient must be positive, refreshed, and ready to face the recovery full on. This is why outside activities and events that are low-stress and entertaining are rehabilitative and necessary. 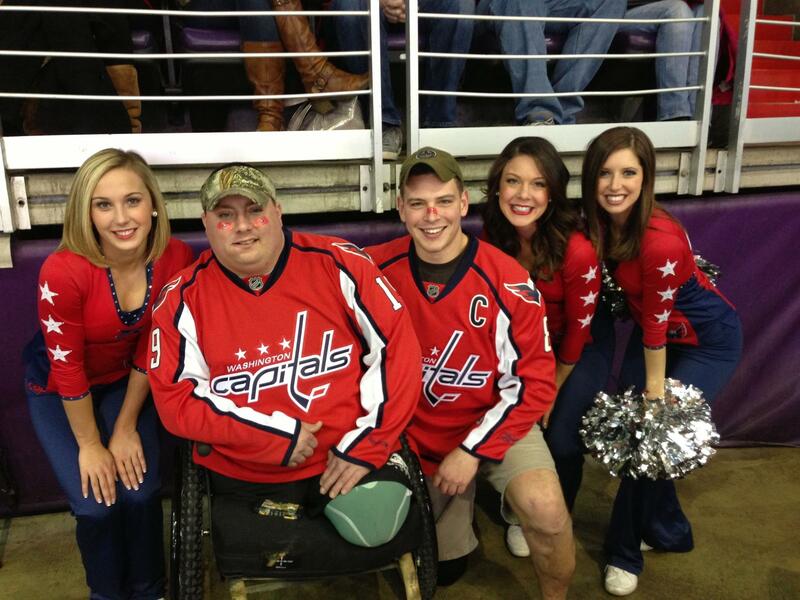 It’s a requirement that Freedom Alliance welcomes, and as a result, we connected with Monumental Sports and Entertainment, an organization that owns and operates both the NHL’s Washington Capitals and the NBA’s Washington Wizards teams. This relationship has allowed us to treat a great number of combat veterans and their families to hockey and basketball games over the last couple of years. 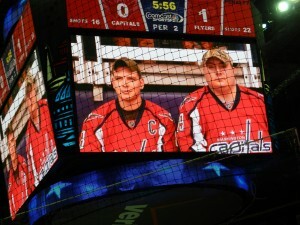 Recently we invited Marine Corporals Christian and John for a Friday-night hockey game—the Capitals versus the Philadelphia Flyers. The Marines enjoyed all the action from superb seats and received complimentary face stickers and Capitals jerseys signed by all the players. They fraternized with the ice-girl “Red Rockers” (cheerleaders on ice skates) and Hockey Hall of Fame legend Rod Langway. Christian and John had the honor of being selected for the Soldier Salute, for which a moment is reserved during the game to pay tribute to our combat veterans. Their stories were read over the PA system to a sell-out crowd while a slideshow of photos played on the Jumbotron. Corporal Christian’s story includes over 160 combat missions completed during multiple deployments to Afghanistan. Two years ago he stepped on an IED (improvised explosive device), sustaining injuries to his legs that resulted in double above-the-knee amputations. Corporal John is Christian’s good friend. John’s account is similar in that he also stepped on an IED, receiving various injuries that required the amputation of his right leg. Since his accident, John struggles with post-traumatic stress disorder (PTSD), but he motivates himself and his fellow Marines by pursuing his passion for outdoor sports, such as hunting and fishing. Moved by these two stories of sacrifice, 20,000 hockey fans rose to their feet to applaud our young soldiers at the conclusion of their presentation. It was a poignant show of support to all our nation’s heroes, being represented that evening by the humble and extraordinary examples of Christian and John. To top it off, the night ended in victory for Washington, as the Caps beat the Flyers three to two. With the NHL lockout finally over and patriotism rampant in the arena—for an evening at least—all felt right and good in one boisterous icy pocket of the world.